Find out how to choose the Best Travel Iron, what are the key considerations and how much will you need to spend to get a good one. Packing a Travel Iron in your luggage is essential if your want to be certain about having a suitable iron when reaching your destination. With so many Travel Irons available we have put together this detailed guide to allow you to quickly compare features, user ratings to find a suitable Travel Iron that meets your requirements. Steamfast sf-717 Travel Iron Review: The SteamFast SF-717 Home-and-Away Mini Steam Iron is a steam iron that removes wrinkles and creases from almost any type of fabric. Bringing a steam iron along with you to work or on vacations is no longer a problem because this unit weighs only one pound. Touch ups to whatever you are wearing is now possible, no matter where you are. The SteamFast SF-717 Home-and-Away Mini Steam Iron is a 420-watt mini steam iron that can remove wrinkles and creases from nearly any type of fabric. The device heats up in as fast as 15 seconds, and comes with three temperature settings to choose from. The iron can hold 1.4 oz. of water. It comes with its own plastic measuring cup and heat-resistant traveling bag for your convenience. Now users can quickly touch-up their clothes at home, at work or on vacation with little effort, for the SteamFast SF-717 Mini Steam Iron is both easy to use and easy to store. Dual voltage – Allows you to conveniently power the iron using different sockets across the world. 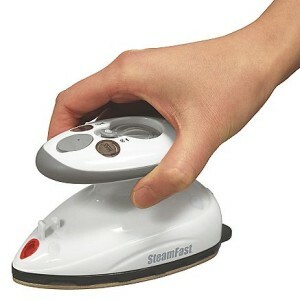 Steam control – Quickly steam out stubborn wrinkles using the One Touch Steam button. Adjustable temperature – Select a temperature that suits your fabric, avoiding any damage. Measuring Cup – Easily measure out the required amount of water without overfilling the iron. Heat-Resistant traveling bag – Easily transport the iron without damaging other items in your luggage by storing the iron in the heat resistant bag. Long power cord – The ample cord of the steam iron allows it to be used easily around any home or hotel room. Those people who have had a chance to use the SteamFast SF-717 Mini Steam Iron are satisfied with how the mini steam iron works. The iron has been commended on how easy-to-use, lightweight and convenient it is. 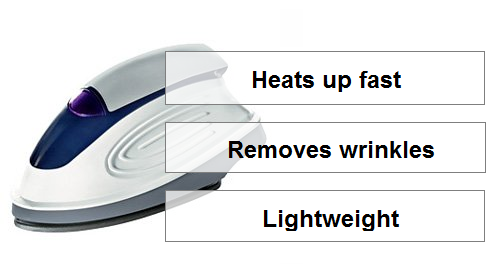 Users also enjoy the fact that the steam iron is able to take wrinkles out of almost any type of fabric and material. “This tiny, light iron took up a small corner in the suitcase and ironed everything beautifully. We travel as lightly as we can, usually just one suitcase for 2 adults and a toddler, including toys. “I put an ironing mat on one end of my sewing table. Now with the help of this wonderful little iron I can press seams, etc. as I sew without having to haul out the big ironing board. Overall, the SteamFast SF-717 mini steam iron works great in making clothes appear free of any wrinkles and creases that shouldn’t be there. 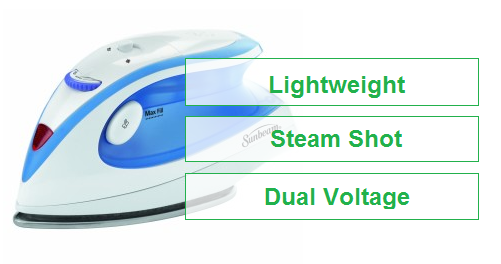 Since the SF-717 only weighs around one pound, and is therefore extremely lightweight, this steam iron is great for traveling. 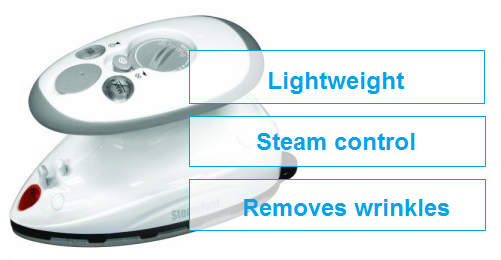 The SteamFast SF-717 Mini Steam Iron has dual voltage for travel purposes, and can hence be used all over the world. I highly recommend this iron to anyone looking for a lightweight steam iron to use around the home or to take on vacation. The SteamFast SF-717 has recieved over 1700 user ratings on Amazon with an average user rating of 4.3 out of 5.0. Sunbeam GCSBTR-100 Review: The Sunbeam GCSBTR-100 is an iron that takes out wrinkles from multiple kinds of fabrics and materials. The lightweight iron manages to take out stubborn creases using its unique Shot of Steam feature. 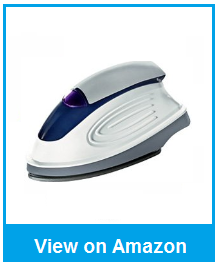 This iron does not spit or leave wet splotches all over your clothes as regular irons do. With the Sunbeam GCSBTR-100, it is now incredibly easy to make your clothes wrinkle free wherever you go. The Sunbeam GCSBTR-100 is a lightweight iron, weighing only 1.2 pounds, which makes it great for traveling. This iron is a practical buy for anyone looking for a good, compact iron to bring along on vacations or business trips. 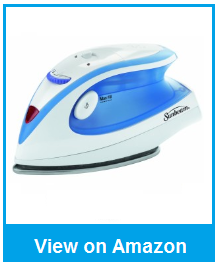 This dual voltage (240/120 volts) iron comes with a special Shot of Steam feature that allows a user to take on those tough wrinkles that don’t seem to want to smooth down. The non-stick soleplate of the Sunbeam GCSBTR-100 Iron allows the device to easily and smoothly glide over your clothes, to avoid the fabric from catching or burning. The iron does not leave any wet blots on your clothes while ironing, heats up very quickly and is very easy to work with. Removes wrinkles – The iron does not spit or leave wet spots over your clothes while ironing. The non-stick soleplate ensures wrinkles are quickly removed. Lightweight – The weight of the iron at 1.2 pounds make it perfect for taking along in your luggage. Dual voltage – For easy travel convenience power up the iron across the globe. Unique Shot of Steam – This feature is perfect for working out tough wrinkles. Variable temperature settings – Pick a temperature to suit the fabric that your ironing. Soft touch handle and dial – The well engineered handle allows for comfortable use when held for a continuous amount of time. 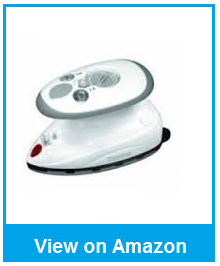 Most users are happy with how the Sunbeam GCSBTR-100 works in taking out wrinkles and tough creases from their clothes. The unit is very easy to take along wherever you go, and very easy to use as well. “This little iron is incredibly light weight- a perfect iron for travel. Yes, the iron does leak a bit after you put the water in, but after it heats up, it isn’t a problem. And this little baby heats up! The hottest setting is the hottest iron I have ever had. “I looked in several stores in the DC area to find the perfect travel iron with poor results so went to Amazon ’cause they have everything you could want. Overall, if you are looking for a good iron that you can easily bring along to work, on vacations or on business trips, then the Sunbeam GCSBTR-100 is right for you. The iron takes wrinkles and creases out of almost all types of materials, and leaves no wet spots in its wake. The sole-plate of the device does not stick to nor catch on your clothes, preventing them from becoming burnt or singed. The Sunbeam GCSBTR-100 has been reviewed by 1258 customers on Amazon with a rating of 4.2 stars out of 5.0. Travel Smart Travel Iron Review: The Travel Smart is a compact iron that allows you to clear you clothes from wrinkles and creases when on the road. 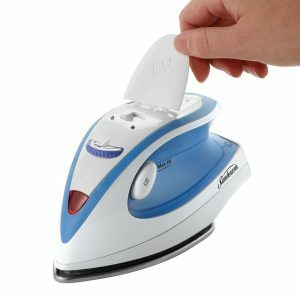 This iron will allow you to iron almost any type of fabric or cloth when on a vacation or a business trip. With the Travel Smart, you can now iron clothes while on the go, to always look good for those memorable snapshots. The Travel Smart iron so lightweight and compact that it allows you to bring it along on vacations, road trips and business expeditions to always look put-together and ship-shape. The extra compact design of the iron allows it to fit easily into any traveling bag. The 8-foot long cord of the device allows you to easily move around while ironing, which is especially important if electric sockets are not easily accessible in a hotel room or inn. The Travel Smart can be used almost anywhere in the world due to its worldwide dual voltage system. It also comes with a storage pouch which makes it even easier to bring around. This device heats up quite quickly, and has an average temperature of 300◦F. Max temperature of 300◦F – They high temperature allows you to tackle the toughest wrinkles in fabric. Extremely lightweight – Weighing in at only 14.4 ounces, the iron will neatly fit into your travel bag/suitcase. Dual voltage system – Use the iron worldwide with its dual voltage system. Heats up quickly – Great when your in a hurry. 8-foot long cord – Allows for easy maneuvering using the iron. Storage pouch – The iron is supplied with an storage pouch for easy transport. Most users who have had a chance to review the Conair Travel Smart Iron are more than satisfied with the quality of its work. The iron is small, lightweight, heats up quickly and runs smoothly. People also enjoy the length of the cord, which makes it easier to be used. “The Conair Travel Iron has many uses. I bought it for quilting: setting the seams, folds, and applique. It uses less electricity (200/360w) compared to 1600 for my full size iron. “Given my intended usage it was perfect. It is very small–fits in your hand. I really liked how easy it was to handle in comparison to a bigger iron. I could work on a smaller area and keep from creating wrinkles with the back of the iron as I was trying to remove wrinkles with the front. If you are looking for a very small and compact iron for travelling purposes, then the Travel Smart by Conair is definitely something you should try out. This iron comes with a worldwide dual voltage system, which allows it to be used practically anywhere in the world. It works well at removing wrinkles from your garments and is tiny enough to fit into any bag without much trouble. What is a Travel Iron? Why do you need a Travel Iron? A travel iron is a small and compact iron weighing generally between 0.5-2 kg that will conveniently fit in your travel luggage. These compact irons are used in the exact same way as a normal iron. Most travel irons are generally priced around the $20.00 mark so don’t expect these small irons to perform just like a $100.00 plus steam iron. They are designed to be used for light touch ups in the comfort of your hotel room. Personally I found that however I pack clothes in backpacks and suitcases they will get creased very quickly. Although you may buy some traveling clothes that do not crease easily or require ironing before use, you will find that most formal and day to day clothes do not fare that well in your travel luggage. When going on a vacation or business trip it is common for hotels to charge to use an iron, or you will find there ironing service is extremely expensive. Very often the iron supplied by the hotel is malfunctioning, usually leaking due to overuse and poor maintenance. Using poorly maintained irons will lead to clothes remaining creased which can be both embarrassing and frustrating especially when you are away for a vacation or are on an important business trip. If you have gone abroad for a vacation the last thing you want to be concerned about is the fact that you may be going to places wearing creased clothes, especially if you may be visiting a fancy bar or nice restaurants. If you have traveled for a job interview or important business meeting, first appearances are a key factor when it comes to being successful in getting that position, or winning that deal. While some people may decide to take their creased clothes to the closest dry cleaners, you can conveniently do this in your hotel room with a travel iron. Having a travel steamer ensures that you will look your best at all times, hopefully making you feel relaxed and good about yourself. If you are traveling abroad then it is important to find out if the country uses a different voltage, since electrical appliances in the US work on 100 volts, but this could be higher in other countries. Try to ensure that your travel iron is dual voltage so it can be adjusted from 100 volts to the 240 that is going through power outlets in other countries. If not your compact iron could be fried. The 3 recommended irons we have reviewed in this guide are all dual voltage. Some irons will allow a user to use a steam shot feature to remove those stubborn wrinkles. The amount of steam you can get from irons will vary, some users have found that the Steamfast SF-717 lasts for between 4-5 shirts. Being able to vary the temperature of the iron is extremely important especially when iron different types of fabric, you want to check if an iron can be adjusted to very low temperatures to iron silk and very high to iron linen. Both the Steamfast SF-717 and Sunbeam GCSBTR-100 irons allow you to vary the temperature. Due to the size of these irons they are lighter then the bigger steam irons you may use at home. This makes them perfectly suited to pack into your suitcase since they will take up very little of your baggage allowance. The travel smart at approximately 11.7 ounces is the lightest of the 3 irons we have reviewed. To ensure you can plug your appliance for use take a travel adapter with you. The adapter is a small plastic piece with prongs that will match up with the holes of foreign power outlets. Always ensure that the model you buy includes a warranty, and even if the cost is a slightly higher than those without a warranty, it gives you piece of mind. Now that you have seen some of the options and our top picks for the best travel irons on the market, it is now up to you to pick what meets your needs, is the iron in your price range? And will it ensure you have a successful vacation or business trip. As you know, new irons are being designed all the time by new and old manufacturers. For that reason, the comparison guide above will be updated as new irons need to be added to the list. Or if you feel like we missed a superior model that needs to be included on the list, let me know in the comments below!